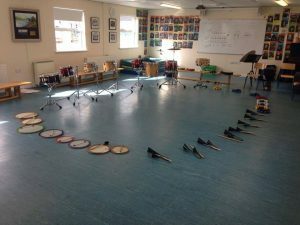 Posted December 12th, 2015 by Mobile Music School & filed under Music Lessons, Percussion Lessons, Pre-Instrumental, Singing Lessons, Uncategorised. Mobile Music School tutor, Katie Carpenter, has just finished up with the wonderful students of Castleknock Montessori School who completed their six week preschool music programme. As we believe that children should be given exposure to music from a young age in a fun, calm and interactive teaching and learning environment, we were delighted to spend the last six weeks introducing these students to percussion instruments, the guitar and the recorder. With these classes, Katie focused on exploring the sounds of every-day life, the sounds of the orchestra and the sounds of voices. The children learnt to perform on percussion instruments and had lots of fun playing a range of musical games as well as learning action songs and music notation. The programme began with the children learning the Dig a Little Deeper song and actions with the guitar, and being introduced to songs such as Do Re Mi. By the first lesson, each student got the chance to strum a guitar with a guitar pick, which was such an exciting experience for everyone. Week 2 included lots of energizers to get the class warmed up before everyone formed a percussion circle to play the Copy Cat Game and Follow the Leader. The children were then introduced to staves and bar lines through a new music theory song in week 3. Katie also practiced body warm ups with the class through the use of a drama poem. Once everyone was warmed-up, the students were then ready to learn Winter Wonderland and use finger puppets to add movement to their songs. One of our favourite ways to teach children how to respond to music and discover movement to suit it is to practice a Christmas mime with music. Week 4 also included some solo singing to encourage students to sing on their own and boost their confidence when performing. Our last lesson consisted of listening to the drum for timing and recognising the tempo in order to differentiate between slow and fast beats. This short programme culminated in an end-of-term performance where the children displayed all their new music skills and techniques by performing the songs they had learned over the course of the programme to an audience. 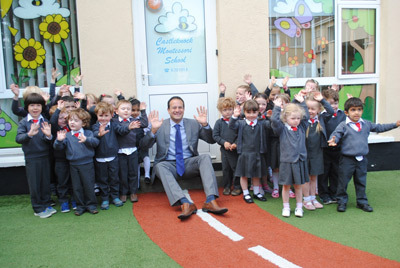 It was a pleasure working with the students and staff of Castleknock Montessori School as they were all so sweet and welcoming. Seeing the children fall in love with the guitar and percussion instruments in particular was a real treat. Our aim is to give children a positive musical experience, which we hope is the beginning of a long musical journey with music making!